WI has a three foot law to protect bicyclists. Despite the law, many drivers fail to give bicyclists three feet space before passing. Even worse, many police officers are not even aware of the three foot law. In Texas, the police are enforcing the three foot law by riding bikes with video cameras. If a car passes the officer without giving the requisite space, the officer calls ahead and the driver is stopped and cited. Tickets in Austin, TX, have cited 104 citations thus far at a cost of $167 each. Read about the enforcement here. Here in Wisconsin the fine for violating the three foot law is minimum $20 max $200 for first offense. I have not heard of any citations for violation of the law in Wisconsin. Click here to read the story of an actual client injured by a driver who admitted not giving three feet before passing. Case was won at trial by bicycle injury lawyer Clayton Griessmeyer. At trial the three Door County WI Sheriff Deputies testified they had never heard of the three foot law. The deputies cited the bicyclist and not the driver who hit the bicyclist from beyond. The jury disagreed and imposed the majority of fault on the driver. Click here to read about an actual past client ticketed for getting hit by a car. 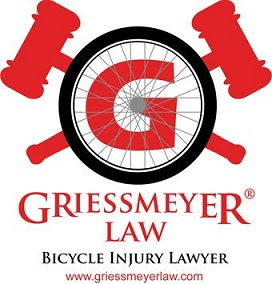 Case was won at trial by bicycle injury lawyer Clayton Griessmeyer. Last winter, I found an effective way to help drivers give me three feet space before passing. How did I do it you ask? I tied a Christmas tree onto my bob trailer. See below. Click to learn more about Wisconsin bike laws. You planning on doing this again? I'll join!